« For we know how dearly God loves us, because he has given us the Holy Spirit to fill our hearts with his love. 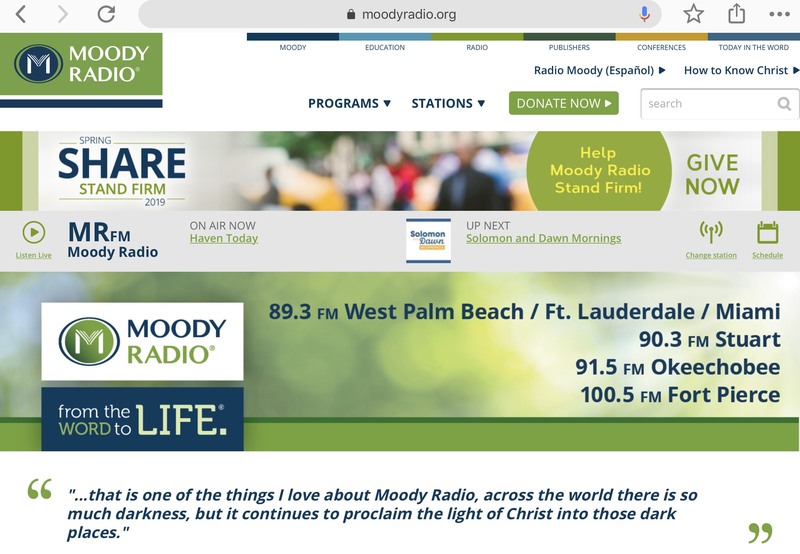 Today is the start of Moody Radio Spring Share 2019 – Stand Firm. If you’re already a listener let me invite you to give what you can. If you have never listened let me invite you to start today. Great way to stay connected to God’s Word where ever you are. Dear Lord God, Abba Father, Jesus my Savior, thank You for each new day and for Your continued blessings that You bring our way through Moody Radio. For helping us ‘stand firm’ by putting Your armor. Though the days may get long and trying, Your sweet touch reminds us of the why, Your why, the bigger eternal picture. It’s in these moments we get just enough wisdom and understanding to forget about ourselves and focus on You and the one You place in front of us. Thank You. In Jesus name I pray. Glory be to the Father and to the Son and to the Holy Ghost; as it was in the beginning is now and ever shall be, world without end. Amen. This entry was posted on March 19, 2019 at 9:19 am and is filed under One Walk. You can follow any responses to this entry through the RSS 2.0 feed. You can leave a response, or trackback from your own site.